This grassroots-generated skepticism points to a real need for better-designed processes around local, smart city deployments — processes that safeguard resident opinions, resident consent, and procedural justice as urban innovation is pursued. In the civic tech community of practice, the mantra of “build with, not for” reigns supreme. The simple phrase hammers home an important process nuance: technology is only as good as it is welcome, relevant, and user-friendly. While the “build with, not for” expectation has shaped the way civic hackers create new apps for our phones, it has not yet been widely embraced by the urban technologists deploying sensors, Wi-Fi kiosks, or other public technologies on our curbs. This reveals a very real and timely challenge as we pursue the 21st century, data-rich, connected, and responsive cities we all desire so much. As more and more technology is placed in the public way, how can we make sure cities are planned inclusively and align with the public interest? What does authentic civic engagement and procedural justice look like during the deployment of new smart city technologies in our communities? I’m honored to tackle these complex questions as a Fellow with the Benton Foundation, an institution known for its defense of the public interest in communications and its research at the intersection of equity and technology. During my tenure as a Benton Fellow, I will be investigating innovative and exemplary cases of civic engagement with smart city technologies, working together with local leaders to knit together a framework and field guide for how planning and deployment processes can be undertaken with residents. 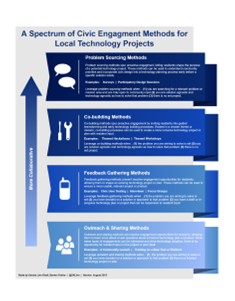 What Does Authentic Civic Engagement Look Like in the Context of Technology? Everyone agrees that inclusion and civic engagement in technology are important, but what is less certain is what that ideal civic engagement should look like given a particular technology project’s scope and constraints. What’s also unclear is how to do civic engagement well, and how to do it authentically. In the context of emerging smart city deployments, where terms like “Internet of Things” (IoT), fiber, and smart street lighting are not dinner time conversation topics, this challenge is particularly acute. At one point or another, I’ve heard all of the categories above—outreach and sharing, feedback gathering, co-building, and problem sourcing—be referred to broadly as “civic engagement” despite the fact that each looks very different in practice, works ideally under different project conditions, and results in varying levels of resident collaboration, inclusion, and power. For instance, outreach and sharing a planned technology project is important and necessary, but essentially creates a one-way dynamic with the residents affected by the technology itself. Feedback gathering, on the other hand, (in the form of surveys, civic user testing, focus groups, comment periods, or draft policy annotations) creates a conversation with residents who seek to shape existing or in-progress smart city infrastructure and policies. Venturing further up on the spectrum is the co-building category which invites residents’ involvement in the design solutions around a specific mission or problem already identified. Problem/opportunity sourcing, perhaps the most inclusive and open-ended of the categories, involves residents in the earliest stage of work before the technology itself is planned or deployed by a City, university, or company. These types of activities are solution agnostic, inviting residents to set priorities which any resulting technologies can be designed around. There will be, someday, an enormous blowback from citizens, about these giant tech company deals, akin to the fury over the Chicago parking meter debacle. By then, the current electeds will have moved on and the city will be left looking thoroughly untrustworthy. Which will make it even more difficult for cities—now trusted more than any other element of government in the US—to address the crushing problems of affordable housing, homelessness, climate change, and other urban issues they now confront every day. Beyond the issues of trust in government, there is an argument to be made that involving residents in technology deployment and design is just good business. When the community has involvement in the build-out of technology, whether it’s new kiosks, a new IoT project, or new public WiFi, it seems more likely that investments will be sustainable, technology will be more widely adopted, and the project will result in more public value. Fortunately, there are concrete lessons to be learned from inclusive smart city efforts across the U.S. These trials in authentic civic engagement, data literacy, and equity around public technology building and planning have uncovered best practices from which all cities can learn. Initiatives like Boston’s Meet the Kiosks and the Smart Columbus Experience Center create spaces where residents can understand and design the use cases around new public technology on sidewalks. Kansas City’s Paint the Town Green campaign ignited a grassroots network to increase Google Fiber sign-ups in the hopes of ensuring equitable infrastructure buildout across the city. Initiatives like Chicago’s Array of Things Civic Engagement Project and Seattle’s Privacy Advisory Committee and Data Privacy Efforts aimed to inform residents and include them in building standards around smart technologies. This year, The Mayor’s Office of New Urban Mechanics in Boston released a request for proposals (RFP) to find a partner to assist with inclusive engagement goals around technology deployment. The project, Beta Blocks, envisions the creation of a thoughtfully-designed engagement process around new civic technologies on streets as well as “smart city” public discussions, among other things. In addition to providing better infrastructure – both physical and social - we need to clarify government’s role in this, create clear policies and permitting, and make digital and data literacy programs available for all Boston residents. Beta Blocks, above all, is not some expansive deployment of sensors or gadgets, but rather an invitation for all to help us dream up what’s next around the street corner. This article is the first in a series highlighting inclusive smart-city building and planning practices. This year, as a Fellow with Benton, I will be working with local practitioners from across the U.S. to (1) understand shared challenges around operationalizing the “build with” ideal for emerging smart city deployments and (2) shine a light on innovative, inclusive practices that cities have already undertaken to weave equity and inclusion into urban technology planning. If you’d like to collaborate, contribute ideas, or have a conversation, please don’t hesitate to reach out. Email me at [email protected] or contact me via Twitter or LinkedIN. Denise Linn Riedl is the Manager of Ecosystem Development for the City Tech Collaborative in Chicago and a Benton Fellow. 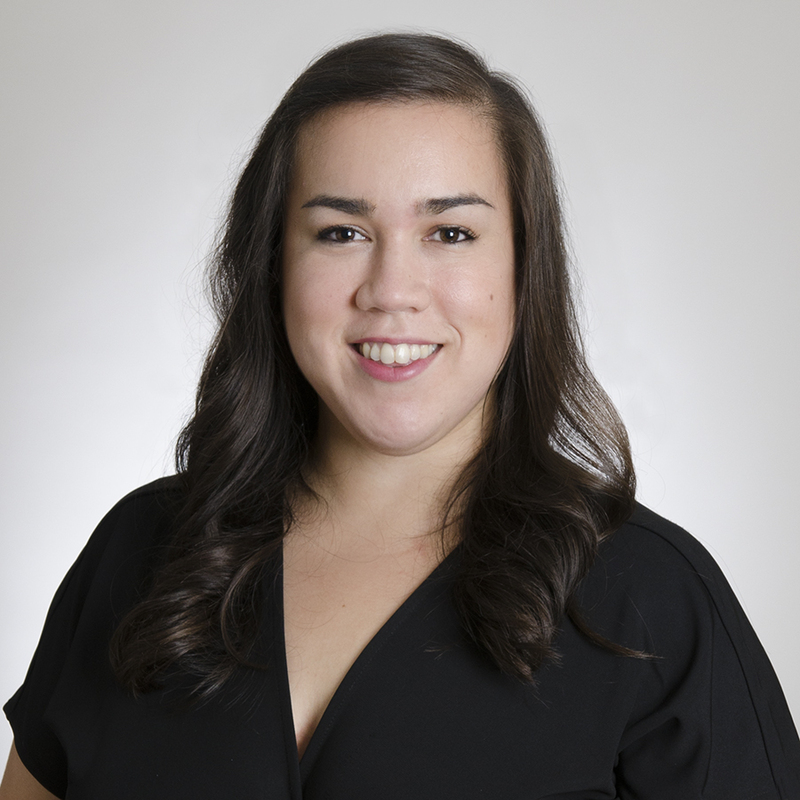 Prior to City Tech, Denise was the Program Analyst for the Smart Chicago Collaborative where she managed citywide digital inclusion and inclusive smart city initiatives like Connect Chicago, The Chicago School of Data, and the Array of Things Civic Engagement Project. Before she moved to Chicago, Denise worked in telecommunications policy and championed abundant, affordable broadband nationally and locally. As a member of the Berkman Klein Center Fiber Team and a co-author with Blair Levin of the “Next Generation Network Connectivity Handbook,” Denise assisted municipalities interested in modernizing their communications infrastructure. She also previously worked in the Spectrum Auctions Division of the Federal Communications Commission. She started her career as an AmeriCorps VISTA volunteer in North Carolina promoting urban and rural broadband adoption. Denise holds a bachelor’s degree in Media Studies and English from the University of Virginia and a master’s in public policy from the Harvard Kennedy School of Government.